The Midwest Museum of American Art in Elkhart, Indiana features one piece of Norman Rockwell artwork in its collection. The Museum counts among its paintings one original painting by Norman Rockwell. That painting is No Credit Given. The Museum also boasts an extensive collection in addition to the Rockwell. The museum is actually housed inside a building formerly used as a bank. It's nice to see an old building converted to a productive use. Also one less bank is nice, too. No Credit Given, an oil on canvas painting, was one of Rockwell's earliest paintings. 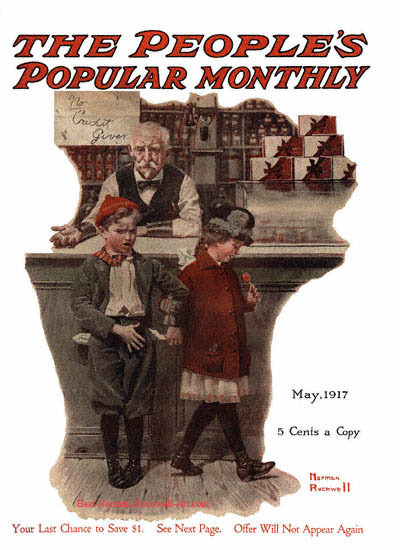 It appeared on the cover of the May 1917 issue of People's Popular Monthly magazine. Rockwell was only twenty three years old at the time of publication. An alternate title for this painting is Shopkeeper and Two Children. The name "No Credit Given" is derived from the shop keeper's sign that informs the young candy buyers that they need money if they want candy! In addition to this original painting, the museum also features a large collection of hand signed Norman Rockwell lithographs. One whole area of the museum is dedicated to Rockwell art. The museum also boasts an original Grandma Moses painting, Sugaring Time, as well as many other works (over 2500 seperate art pieces from different artists). Even the old vault of the old bank is used to display artwork. I heartily recommend a vist to this museum. Of course, these artists are just the tip of the iceberg. The museum also has a fascinating pottery art collection in addition to the numerous paintings. Of course, I am going to view the Rockwell, but the rest of the collection seems worth seeing as well. Museum hours are Tuesday - Friday 10:00am to 4:00pm and Saturday & Sunday 1:00pm to 4:00pm. The museum is closed on all Mondays and holidays. Admission is $4 for adults, $3 for seniors and $2 for students.